Members of the Society of the Friends of the River Ina and Gowienica, the Polish part of Oder Delta rewilding team, partners and volunteers created new gravel beds as fish spawning grounds on the Ina and Gowienica rivers and their tributaries in Poland. Use of an excavator made spawning ground restoration work more efficient in places where access to the watercourse was possible. Many streams and smaller rivers on the Baltic Sea coast bordering Germany and Poland are currently in very poor condition. The reintroduction of species (such as salmon, sturgeon and sea trout) here means that aquatic habitats urgently need to be improved. The Rewilding Oder Delta team and partners are now working to restore fish populations and fish migration in the Oder Delta Lagoon and associated rivers, in collaboration with local communities and state agencies in both countries. In late October, members of the Society of the Friends of the River Ina and Gowienica (TPRIIG), together with a group of anglers from SMOLT Goleniów, added nine new gravel beds (as fish spawning grounds) on the River Bącznik (a tributary of the River Ina near Bolechowo), six new gravel beds on a tributary of the River Gowienica, and two new gravel beds on the Gowienica itself (as well as supplementing an existing spawning ground on the Gowienica). All of these waterways are tributaries of the River Oder. A total of 30 people participated in the spawning ground restoration work, including a large group of children. With unusually warm October weather conducive to outdoor activities, a total of 30 people participated in the work, including a large group of children. 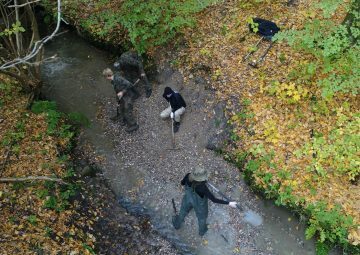 Their efforts were aided by a rented excavator, which the team used to add more than 120 tons of gravel and stone into the rivers. 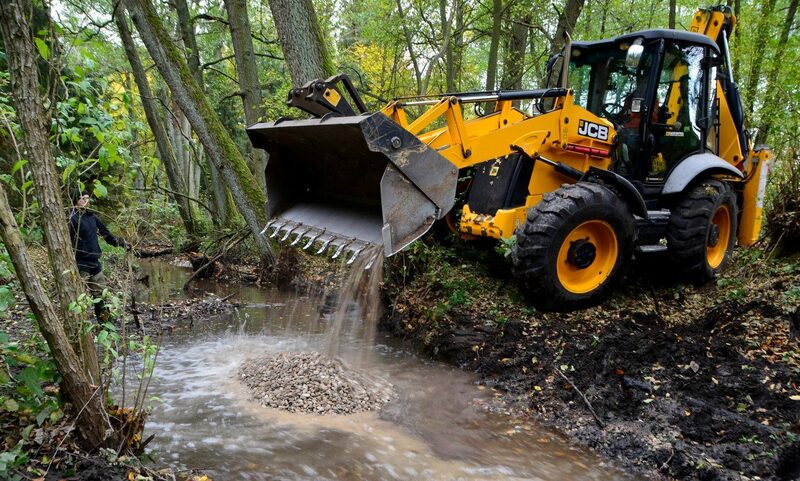 In addition to providing areas where fish can spawn, gravel beds in small mid-forest streams help to stabilise river flow and ensure minimum water levels during dry periods. The spawning ground restoration work was preceded by several months of preparations. Arrangements were made with various authorities related to the forested areas where the rivers are located – the Regional Directorate for Environmental Protection in Szczecin, the local water administrator, the State Water Management in Poland, the Water Management Authority in Szczecin, the Water Supervisory body in Goleniów, and the Forest Inspectorates of Goleniów and the village of Kliniska. An expert, Józef Jeleński, helped the restoration team to select the optimum size of gravel used. He has previously trained some of the other team members in the selection process during previous workshops. This training allowed the restoration work to be conducted efficiently and ensured the functionality of the gravel beds in accordance with relevant regulations. Under the guidance of Józef Jeleński, gravel is formed into a spawning bed. Similar efforts will be repeated every year in different parts of the Ina and Gowienica river basins, to improve their ecological condition. Funds for gravel purchase and equipment rental came from the Society of Friends of the Ina and Gowienica rivers, and subsidies from the Baltic Sea Conservation Foundation, made available through the Szczecin-based Green Federation GAJA. Fish spawning activity actually took place on some of the newly laid gravel beds, despite the lateness of the season. While there were perhaps more fish willing to spawn, the overall numbers in 2018 were low. There are several reasons for this, from very warm summers and extremely low water levels at the spawning grounds to excessive fishing pressure downriver. During the restoration work it was agreed that similar efforts will be repeated every year in different parts of the Ina and Gowienica river basins, as this is the only way to improve their ecological condition. Similar efforts also took place in 2018 in the Rega and Parsęta river basins (both rivers flow into the Baltic close to the Oder Delta).